I would say “Long live the Queen!” but I haven’t gotten a new one yet. 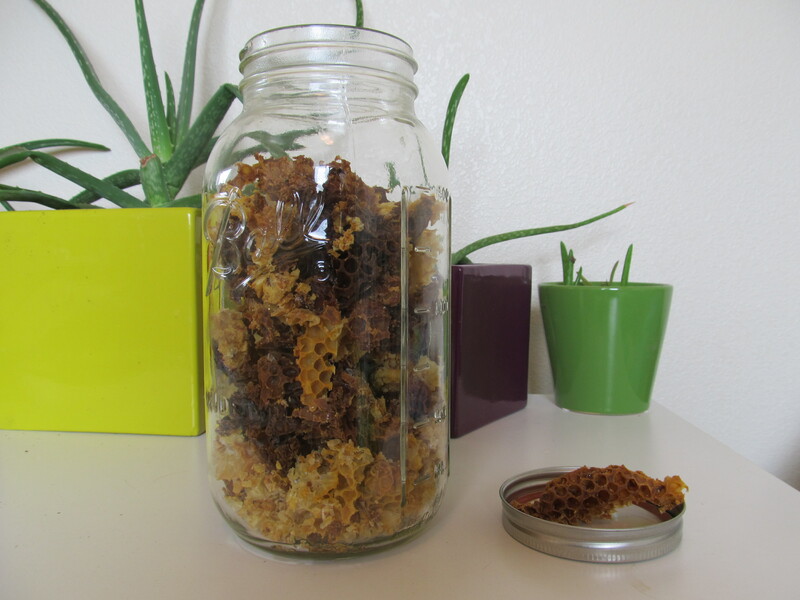 As a first-time beekeeper, my job was to get my hive through the winter and into the first honey flow intact. When I first started poking at them, I was thrilled to see that there were lots of girls climbing around what had been the brood area. It was slightly off to one side instead of truly centered, but if that’s where the queen wants to lay? That’s where the queen lays. I was so excited that I was telling everyone my hive had survived the winter! Until someone asked if my queen had survived. Good question. I hadn’t had a chance to really get in there and do some spring cleaning until this weekend. Between work, weather, and the hike to get to the friend that’s baby-sitting them for me, it was a challenge. My friend has been watching them- and was really getting a kick out of watching them bring so much pollen back even very early in the spring. I had every reason to think that 100% of my hives had made it through the winter. How many beekeepers can say that? The dark comb is from brood frames and the light comb is from the top of brood frames or honey frames- those places don’t get walked on as much. One of the early chores on a warm day is to check frame-by-frame for leftover honey, pollen, and brood pattern. I wasn’t the most attentive beekeeper last year, so I was also doing a fair amount of scraping off comb that had been laid down where it shouldn’t have been. There was honey left over, which explained why they weren’t really taking much advantage of the feed I had started giving them. As I got closer and closer to the brood, I started to get concerned. I ran into some drone cells (I really should have had my camera with me so I could show you) but I brushed it off as a rogue worker. But no actual brood ever showed up. Seeing as how there wasn’t even any sealed brood, I’m guessing I lost the queen months ago. Since I lost the queen but kept the workers, does that make it a 50% loss, or is it a 100% loss because they will die eventually and not be replaced? Now, when you lose a queen, you have two choices. You can requeen them by buying a queen or, if you’re good, replacing her with one you happen to have bred yourself. Or you can just start all over again. (Hoping they will requeen themselves only works if they catch the loss when they have very young brood to work with.) In my case, I havea few concerns. With as old as my workers are, would they be able to properly care for a queen and the brood she would have to lay very quickly to get them up to par? I’m not really willing to bank on that, since it’s the very young workers that are nurse bees, not the ones that have nearly worn themselves out. There are also a couple of irregularities in the hive- not all of the drones had hatched and some were clearly dead in their cells, and there was something that looked a lot like sand all over the hive. Are they just being sloppy, or are they diseased? Do you know what that yellow sandy-looking stuff is? I don’t. 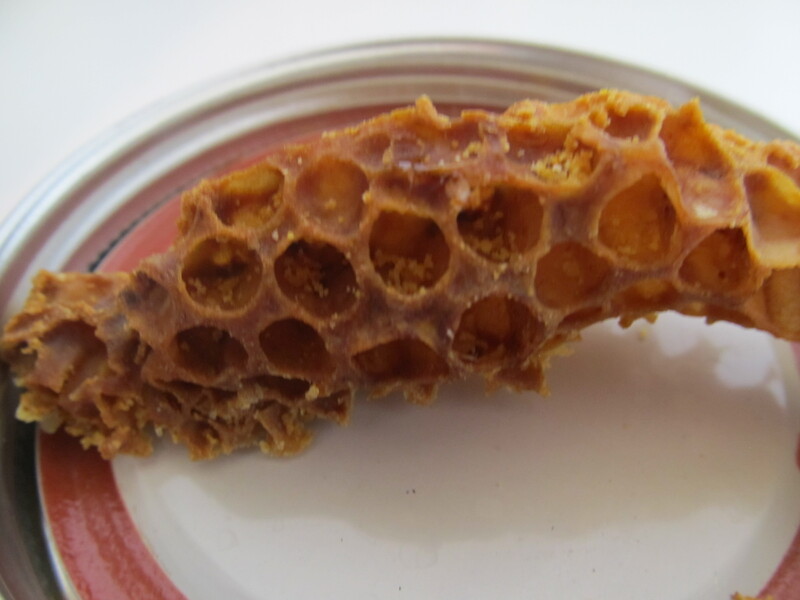 I’m reaching out to my apiary society for some help in determining whether either of these is a real problem if I decide to re-use the drawn comb and other hive parts. If I get a box of bees and I can install them in pre-drawn comb, that means they can get down to setting brood and gathering nectar that much faster. I could even potentially add them to the workers that are already there to give the population a little boost. The more bees I have already gathering nectar and pollen to feed them, the more of the younger bees in the box can be left inside to nurture the brood. So far, the suggestion is to leave it in the care of the girls that are left. They should make/keep it tidy themselves. If I lose them before I get a new set to put in there, clean it out as well as I can and freeze the frames for at least 24 hours. This won’t affect any pollen or honey in the frames, but it should kill any mites or other issues in the wax. I will keep you updated as more information comes in. On a more entertaining note, this video is awesome!